When I was fresh out of college, it was time to start my career as an educator. I was very passionate about the game of basketball, and that was part of the reason I wanted to teach and coach. I had passion for the game. I still love it today and look forward to the start of college basketball season. But while I had passion, I didn't necessarily have a strong or clear purpose. I was just finding my way. Although passion is great, we can be passionate about things that lack significance. We can be passionate about a game. We can be passionate about cars, or coffee, or even Netflix. Certainly, there's nothing wrong with passion and enthusiasm for these things. But it's not something with inherently larger meaning or significance. Purpose, on the other hand, is about having a mission. It's about living a life of meaning and significance in a very intentional way. I'm defining purpose here as something that transcends what we do and becomes more about who we are. It's not what you do, it's why you do it. Your true purpose isn't limited to one role in particular. I can carry out my purpose through my role as a principal, or as a dad, or as a writer through blogging or writing books. I can carry out my purpose in whole variety of ways. I can also carry it out in casual conversations with just about anyone I meet. While I am passionate about being a principal, who I am is much bigger than my profession. My overarching purpose is much bigger than my title. Don't get me wrong, being a principal is one of the most rewarding ways I get to share my purpose. I love it. But my why is still much bigger. My why is to help others grow their own capacity and find their personal path of purpose. A purpose that has power adds value to people. It focuses on making things better for others. My passions may change over time, but for the most part, I believe my purpose will only grow stronger. 1. No one can take away your purpose. Some things we are passionate about might be taken from us. Don't build your foundation on something you might lose. 2. Your purpose is usually developed, not discovered. We grow into our purpose. It doesn't just arrive like the mail is delivered. It's grown like the largest tree in your back yard. 3. You won't be fulfilled if you aren't fulfilling your purpose. You'll be restless and uneasy and searching for meaning. So many people are searching for happiness and what they really desire is purpose. 4. Apathy is no match for true purpose. The key to motivation is to know your why. 5. When you connect with people who share your purpose, it's electrifying. You feel understood and energized. It's like doubling the voltage. 6. When you have a strong sense of purpose, obstacles are no match for your persistence and perseverance. 7. Your purpose will give you a sense of peace. You'll know you're doing exactly what you're supposed to be doing when you're living out your purpose. 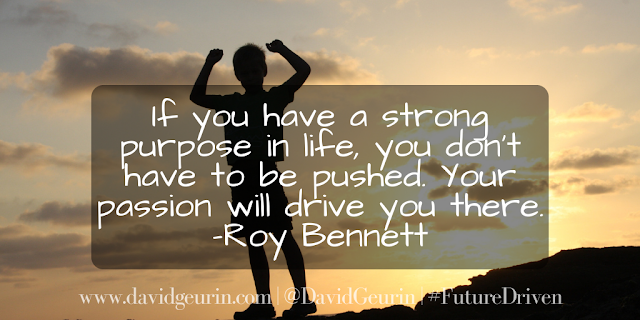 What are your thoughts on living with a sense of purpose? How can we help our students find meaning and significance? How can we help them find a path of purpose? I want to hear from you. Leave a comment below or respond on Facebook or Twitter.